German unification proceeded in installments. The Austro-Prussian War of 1866, which might legitimately be labeled a German civil war, resolved the "German Question" by excluding the Habsburg Empire from the future nation-state. 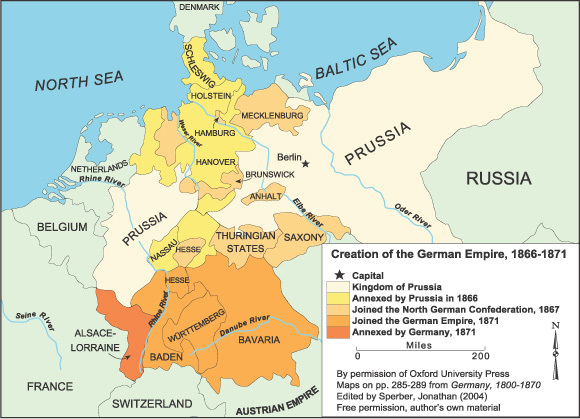 A victorious Prussia immediately annexed the Kingdom of Hanover and other sovereign territories in the north that had divided its eastern and western parts since 1815. It then compelled the Kingdom of Saxony and other states north of the River Main to join the North German Confederation in 1867. For the next three years the prospects for unity did not appreciably brighten, as Bavaria, Württemberg, and Baden resisted Prussian hegemony. But the outbreak of war with France in July 1870 rallied residents of these states to the national cause. Eventually their rulers agreed to join the new German Empire [Reich] when it was proclaimed in the Hall of Mirrors at Versailles on January 18, 1871. The French territories of Alsace and Lorraine were spoils of war that fueled feelings of revanche in France. By permission of Oxford University Press, www.oup.com.